You only have to look at your electric bill in the summer months to know that excessive air conditioner use wastes a ton of energy. But nowadays, we all understand that besides the strain it puts on pocketbooks, wasting energy puts a terrible strain on the environment. Much of that extra electricity we pay for over the summer is generated by burning fossil fuels – and in staggering amounts. Consider that air conditioner use in the U.S. alone causes an average of about 100 million tons of CO2 emissions from power plants – every year. We’ll do anything to cool our homes. Even the newer “environmentally friendly” air conditioners emit greenhouse gases. If we don’t find ways of cutting back on air conditioner use, it will account for over a quarter of all greenhouse gas emissions by 2050. It’s a vicious cycle when you think about it – we rely on air-conditioning to get rid of heat, but every time we use it, all we do is make our planet hotter. And besides polluting the outside environment, excessive air conditioner use can also have a negative impact on the air you’re breathing in your home. According to the EPA, indoor air is often more polluted than outdoor air, even in the largest and most industrialized cities. Fortunately, there’s a way to break this cycle of global warming, get rid of some of those toxins, lower air conditioning cost and cool your home by using a better, cheaper, and more environmentally friendly way to keep cool during the summer: creating fresh airflow through cross ventilation. When you need to cut the electric bill, it’s one of the best energy savings ideas. If you can get a sufficient quantity of air constantly recirculating throughout your home, heat will dissipate and the “wind chill effect” will cool your home on all but the very hottest days. The problem is that ordinary windows are often too small to provide ventilation to move enough air through your house. And the airflow from windows is often blocked by furniture. But doorways are, of course, much larger than windows and unobstructed, providing a huge space to create airflow, bring new air in, and cool you down. By adding screen doors to your home and setting up fans, you can quadruple your in-home airflow, allowing you to limit air conditioner use to the very hottest days and creating energy cost savings. When your air conditioner is running all day, every day, all summer long, you’re merely “renting” your comfort, rather than investing in it. Purchasing a high quality screen door may very well cost more than your average monthly electric bill, but it holds the promise of reducing your ongoing monthly spend for cool air in your home, and will pay for itself in just a few months. When you need to cut your electric bill, the cost savings can be significant, particularly when you consider that a PCA screen door can last for 10 years or more. 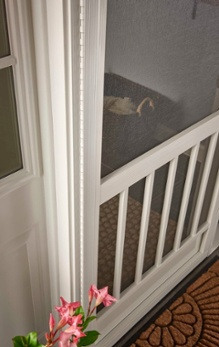 See how a screen door can save you money with our PCA energy savings calculator. You’ll also be saving money, saving the planet, and saving yourself and your family from indoor pollutants. We all need to find more environmentally friendly ways to cool your home, stay comfortable, and – believe it or not – installing screen doors on your home is a very good place to start. The opportunity to create fresh airflow is just another reason to buy a PCA Aluminum Screen Door. A screen door built to last, with features you’ll enjoy for many years.